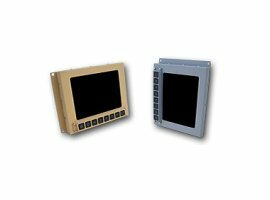 The RFPD Series of Ruggedized Flat Panel Displays are video monitors designed for use in harsh environments, ranging from construction and mining vehicles to military armored ground and airborne vehicles. The displays are designed and manufactured to achieve full MIL qualifications. Each model provides an LCD with a proprietary, bonded anti-reflective glass panel for increased ruggedness, viewing angle and illumination. An eight-button control panel provides for the simple control of all display functions and on-screen menus. Proprietary solid-state LED backlighting achieves a typical 600 NITS of illumination, eliminating the use of CFLs containing hazardous materials. The display's modular design allows for each customer to configure their display to meet their requirements.